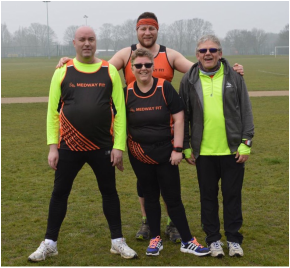 Every Saturday morning at 9am Medway Fit participates in free, timed 5km runs at Gt. Lines parkrun and other parkruns sites across the UK. We also encourage our runners to engage with our local Medway Sporting Legacy 5km Summer Series which is hosted at various venues across Medway throughout the summer months, culminating with a floodlit evening of racing around the Medway Park running track. We also host semi-regular 5km runs as part of our Thursday evening group training that meets at Great Lines Heritage Park from 6:30pm to 7:30pm. We usually time these runs and make the final times available via our Facebook page.